Why aren’t design critiques a standard part of our design process? Why aren’t critiques visualized as an iterative loop in every design model diagram? Design critiques, whether formal or informal, are an important tool to have in your toolbox. When they focus on the goal of meeting your objectives (rather than personal likes and dislikes), they may provide some of the most valuable feedback you can get. Design critiques can be for anything you choose: user interface, instructional design, visual design, game design, story design, etc. 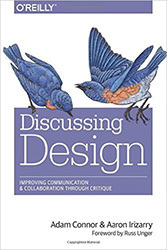 In this episode, I speak with Adam Connor, co-author of Discussing Design. Adam is VP of Organizational Design at Mad*Pow, where he designs and develops products, services, and strategies aimed at tackling challenges in healthcare, finance, and education. TRANSCRIPT: Download the ELC 040 Transcript. Glad you liked it, Michelle. I wondered if the audience would be able to relate to it. It’s a good book! Hey Connie. Nice to see this. My team does what we call an Alpha review for everything we do. And we have been doing it for years! We have standards for what to look for if is it someone from our instr design team is reviewing vs. an sme vs. business sponsor. Nice validation for our practice. You’re such a great interviewer! Thank you both. Lots of practical tips I can take back to my work and my team. Looking forward to reading the book! That’s very forward thinking, Michelle. Do you have a few best practices you’d like to share?